Grenada offers some of the Southeast’s best outdoor resources and activities for the entire family. From our nationally recognized Grenada Lake and its recognition as the best Crappie fishing in the US to our picturesque Dogwoods Golf Course to premier outdoor camping and to the most beautiful countryside in Mississippi, Grenada has it all. You can also find unique historical sites, small town shopping, down home cooking and a hospitable and welcoming community. Enjoy your visit to Grenada….. Where Memories Are Made. 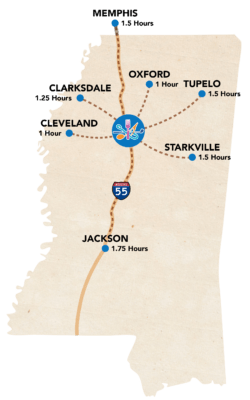 We are conveniently located half way between Memphis, TN and Jackson, MS on I-55. Other travel destinations are just a short drive from Grenada.